Not everyone has a degree in wildlife biology, nor the time to constantly scout and study whitetail deer. Fortunately, whitetail experts like Craig and Neil Dougherty can share their wisdom and insight through a variety of books documenting their vast experience. NorthCountry Whitetails has created a library of thoughtful selections chosen especially for the whitetail enthusiast. We offer a wide selection of books providing key insights into the development of a hunting property and hunting skill. Select a book or two today and allow the whitetail experts to take the guesswork out of your hunting equation. 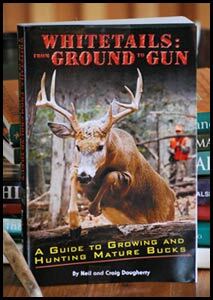 "Whitetails: From Ground to Gun" A Guide to Growing and Hunting Mature Bucks. Neil and Craig Dougherty’s new book, Whitetails From Ground to Gun is promising to revolutionize whitetail deer hunting. That’s what early reviewer’s are saying. As Brian Murphy, CEO of QDMA, stated, “this book ….is a monumental leap into a new era of whitetail knowledge---how to think like a deer, not a deer hunter… this book represents the next frontier in the QDM movement… a clear roadmap for QDM success. The Dougherty’s first book, Grow ‘Em Right, is an industry best seller. It is considered to be the “Bible of property management”. Their new book picks up where the last one left off. Murphy concluded that the book “provides detailed insight into what makes a great hunting property and how to consistently harvest mature bucks”. According to Craig, “The questions have changed, they used to ask “how do I build a great deer hunting property and grow big deer”? Now they are asking, “now that I have big bucks to hunt, how the heck do I kill them?” That’s what this book is all about, connecting the dots between the land, mature deer, and the hunter”. The book is organized into two parts: Part I “The Land Connection” (Click Here to download an Excerpt) focuses on the relationship between land and white-tailed deer. It examines how deer use land and how to create outstanding whitetail properties. Part II “Mature Deer and How to Hunt Them” (Click Here to download an Excerpt) provides unique insights into mature deer behavior and how to hunt them. In total there are almost 300 pages, over 200 photos in 12 chapters. "Grow 'em Right" A Guide to Creating Habitat and Food Plots. If your dream is high Quality Deer Hunting, this book is for you. 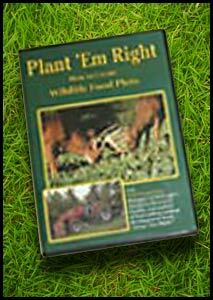 It contains hundreds of proven, easy to follow tips on creating habitat and food plots. 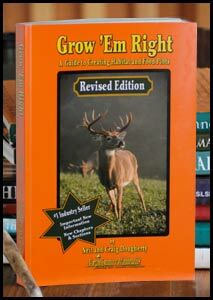 This "how-to" book by the country's leading experts will lead you to the deer of your dreams. This book is a compilation of what the authors, Craig and Neil Dougherty, have learned over the past 15 years. The book is organized around the NorthCountry Whitetails Demo Center tour and the incredible success they have experienced on the 500-acre property. It is also a response to the tens of thousands of questions they are asked by quality deer hunting and habitat enthusiasts. It presents many practices that have never been seen in print before. It is very practical and easy to follow. Everything in the book has been field tested by Craig and Neil. They freely share what works and yes, what doesn't. Their goal in writing the book is to help others experience the thrill that comes from creating high quality deer hunting through habitat management and good land stewardship. Chapters include information on evaluating property, buying or leasing, browse and cover; creating food plots, ATV planting, deer nutrition, selecting seed blends, preventing trespassing, hunting vs. feeding plots, hunting techniques, choosing equipment, creating sanctuaries and much more. There is also a BONUS "How-To" Planning Guide included in the book. "For too long, many have viewed the concept of land development and quality deer management as something complicated. Although it can be difficult if not done properly, pulling it off is not rocket science. Grow 'Em Right: A Guide to Creating Habitat and Food Plots , will show you how to obtain the results you are dreaming about in the least amount of time." "Grow 'Em Right provides cutting-edge information on how to grow and harvest quality white-tailed deer in a practical, straight-forward approach that anyone can follow. Because many techniques covered in the book are specifically-designed for small properties, Grow 'Em Right opens the door for anyone interested in implementing a Quality Deer Management program." New and Improved, Second Edition With Even More In-depth Information and 3 Brand New Chapters!!! Revised Edition Available NOW Don't wait order yours today!!! Revised Edition Available Mid-April 2006 management and good land stewardship. Follow Neil Dougherty as he explains the ins and outs of food plot preparation and planting while using a wide array of implements. Whether you have access to rakes and shovels or full size farm equipment you are sure to learn a trick or two while watching this DVD. COPYRIGHT 2014 NORTHCOUNTRY WHITETAILS LLC.